Love him or hate him, almost everyone who knows Jeffrey Archer's name has an opinion about him. Jeffrey Howard Archer, the controversial British master storyteller is an English author and former politician from Great Britain, whose novels have topped the bestseller lists around the world, with sales over 250 million copies. He holds the record of being the only author ever to have been a number one bestseller in fiction fourteen times, short stories four times, and non-fiction (The Prison Diaries). 'Not a Penny More, Not a Penny Less was Archer's first novel, first published in 1976. No one can weave a web of suspense, deliver a jolt of surprise, or teach a lesson in living like him.Recognized by his fans as good entertainer, with the essential humor in his writings, but with anticipated twists and little surprises, Archer, in his writings, takes us to places we've never seen and introduces us to people we'll never forget. He is stranded with options: Is he the son of Arthur Clifton, a stevedore who worked in Bristol docks, or the first born son of a scion of West Country society, whose family owns a shipping line? The gripping story ranges across these 20 years, spanning from the ravages of the Great War, to the outbreak of the Second World War, when Harry has to make a decision: Whether to take up a place at Oxford, or join the navy and go to war with Hitler's Germany. 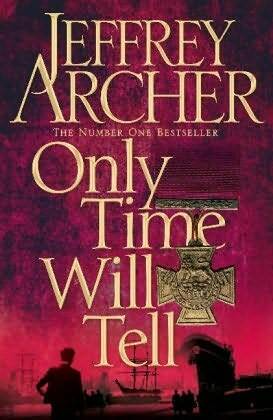 Must be an enjoyable read Only Time Will Tell by Jeffrey Archer. loved the way you wrote it. I find your review very genuine and original, this book is going in by "to read" list.